1. 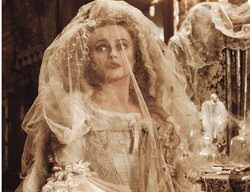 How does the poet convey the character’s (Havisham’s) conflicting emotions in line one? 2. What feelings are conveyed by the metaphor ‘dark green pebbles’ in stanza one? 3. How is a sense of decay created in stanza two? 4. Why does the character refer to her lover as a ‘lost body’ and a ‘male corpse’, and what is the effect of this? 5. What is the effect of the lack of punctuation in line 12? 6. Why does the poet use ‘b-b-b-breaks’ as the final word of the poem? <make your point>. <give example>, <explain your choice of example>. ‘Havisham’ is a poem about lost love. ‘Love’s hate behind a white veil’, links hate and hurt with the romantic view of love that we associate with marriage and the wedding veil.